The Scottish Terrier may look adorable and sweet, but it is known as a truly rugged dog. Not only is this breed smart and active, it is also very smart and very determined. It is constantly ready to take on whatever may be thrown its way. It is not uncommon for the Scottish Terrier to show signs of aggression towards other dogs or even other types of animals. With strangers, it is a bit more friendly, but still tends to act on the reserved side. It is a very loyal creature and is known to be very devoted to its owner and family. It is a sweet, lovable dog even though it may come off as independent and stubborn. It does require company most of the day and if it is left alone for too long, it may cause a scene and bark loudly. This short-legged breed still likes a good adventure even if it is not as fast as other terriers. It still has the thirst for mental stimulation and physical exertion. It is recommended to at least take a Scottish Terrier on a moderate walk once a day. They also like to explore and are always open to an adventure. Although, it can certainly survive in the outdoors, especially due to its wiry coat, it thrives best when indoors. Its coat also needs to be groomed about three to four times per week to ensure that it remains smooth and unmated. They do require grooming and clipping every so often as well. Scottish Terriers major health concerns include vWD and CMO, nWD or non Willebrand disease, is most commonly found in not only dogs, but humans as well. When it effects dogs. It is the deficiency of the von Willebrand factor which is a protein that is required for the adhesion of platelets. ABO blood groups may have a hand in how serious this condition can be. CMO is another big concern with Scottish Terriers. Breeders even go as far as removing dogs diagnosed with CMO fro, the gene pool. CMO stands for Caniomandibular Osteopathy. Dogs with this disease experience thickening in their facial bones that can alter their profile or effect their eating. It can become quite a serious condition. If Scottish Terriers are kept healthy, they typically live up to 13 years of age. The history of the Scottish Terrier can be considered quite confusing. Although it stems from the early term, Scotch Terriers it was once even grouped with Skye Terriers. 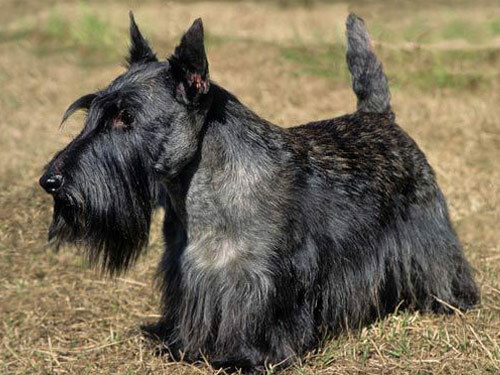 Despite their actual origin, it was not until the late 1800’s that the existence of the Scottish Terrier actually became documented confidently. The Aberdeen area favored this breed and it was almost documented as the Aberdeen Terrier. There were protests circling this creed that ultimately led to a detailed description of what actually makes a dog a Scottish Terrier. It first arrived in America in 1883 and tended to gain more popularity in World War II. After the war was over, the popularity of this breed sky-rocketed.